In our commitment to help you look your best even without makeup, we gathered and reviewed 5 of the hottest toners that are creating a buzz in the market today. These products were then ranked based on what we think is the best toner for dry skin based on ingredients, ability to nourish and hydrate dry skin and price. ​For a toner that comes in lotion form, the Lotion ﻿﻿﻿Yon-Ka PS by YonKa is for you. Made of 99% natural ingredients, it is refreshing, soothing, and hydrating, and can be used day and night. The Soothing & Moisture Aloe Vera Toner by Nature Republic soothes the skin with its 90% Aloe Vera content. It also has a fast absorption formula, and a non-sticky texture. Murad’s Hydrating Toner is a product that restores the skin’s natural pH. It softens skin with its Cucumber and Chamomile extracts, and helps tighten pores with its Witch Hazel content. The Rose Water Spray by Bleu Beauté also helps in restoring the skin’s pH. It also doubles as a hydrating anti-aging serum and can help boost the production of collagen. Here, we have a list of the best toners for dry skin that are set to amp up your beauty routine. The rose water content of this product makes this the best toner for dry skin. This ingredient is a must because it soothes and hydrates skin to help it look more radiant and younger-looking. It also works to fight the signs of aging. This product is proven to boost the production of collagen, which in turn visibly reduces the appearance of fine lines and wrinkles. Aside from healing dry skin, this product can also be used to remove makeup. It can also be used to treat damaged hair, and is a great addition to your aromatherapy sessions. Those with oily skin can also benefit from using this toner because it unclogs pores and treats pimples and blackheads. It also soothes redness around the eyes for a fresh and relaxed look. You have to try this best toner for dry skin because it really gives immediate results. It also comes with a tender floral scent which will leave you more energetic and instantly refreshed. This, for us, is the best toner for dry skin because it makes use of 99% natural ingredients. It contains quintessence Yon-Ka, which is a blend of essential oils, and hydrating plant glycerin. Essential oils like rosemary and lavender help purify, revitalize, and balance the skin. Its energizing effects can also benefit the whole body, and prepares skin for beauty products. This healing mist is more than just a toner—it is a phyto-aromatic fountain of beauty. It also comes with a nice scent, so aside from caring for your skin, this product also helps you unwind. Most importantly, this product is alcohol-free. It sanitizes, tones, and refreshes skin to bring out a fresher and healthier-looking face and a more radiant complexion. You’ll really love this best toner for dry skin because it comes in lotion form. We think this is brilliant as it makes it more fun to apply, and a break from toners that often come in liquid form. The lecithin content of this product makes this a must-try product for dry skin. Lecithin is known to be a great emollient and it works by locking-in moisture to restore the skin’s suppleness. Alcohol-free, this toner helps in restoring the skin’s pH balance and by neutralizing surface impurities. Lightweight, it rehydrates and refreshes the skin making it ready for any treatment. Another plus are its Cucumber and Chamomile extracts. Great for dry skin, these ingredients help by softening and calming sensitive and irritated skin. You should still bo cautious with this one since it contains Witch Hazel, a widely known irritating ingredient. What makes this the best toner for dry skin is its content of Chamomile extracts. This is great for dry skin because it is packed with antibacterial and anti-inflammatory qualities. Chamomile’s properties allow it to penetrate into the deep layers of the skin to preserve its youthful appearance. It also lowers inflammation, providing relief to irritated, sensitive skin. This product is designed to tone and restore balance. Free of alcohols, this unique formula restores and calms the skin’s acid mantle to help get it back on the right track. Another awesome ingredient is glycerin. A great moisturizer, glycerin acts as a humectant to draw water into the outer layer of the skin to help it lock-in water even better. It also contains rose water, which is known to be a good moisturizer and provides excellent hydration. 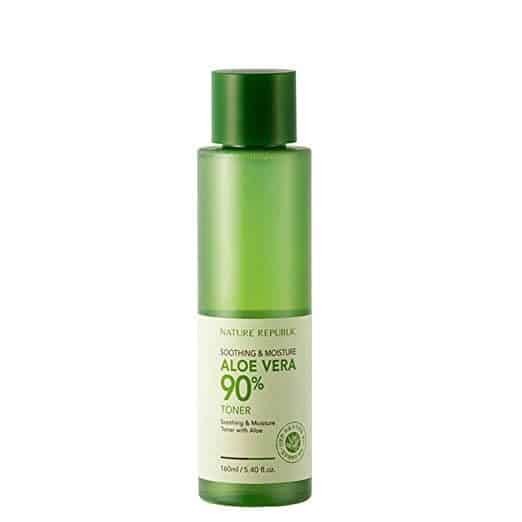 Its 90% Aloe Vera content makes this the best toner for dry skin. We know how great the plant is for dry skin, because it effectively soothes skin with its intensive moisturizing abilities. This product also leaves the skin calm and comfortable. It provides instant relief to inflammation and skin redness, making you ready to conquer the day without any hesitation. It also boasts of its fresh, non-greasy formulation. This allows the product to be absorbed quickly by the skin, so you can go on with your day without feeling sticky and uncomfortable. This toner is also free from artificial coloring, benzophenone, mineral oils, talc, and parabens. It claims to be suitable even for sensitive skin, but since it has fragrance, use this product wisely. You probably already know that these two can “restore” the texture of your face. But, do you really understand the specific roles they play? While they are both used after cleansing, their difference lies in the ingredients they contain and their usage. Astringents have a high alcohol content while toners are the exact opposite. Plus, they are mostly made up of water. These things make toners milder and gentler for daily use. They work by nourishing and keeping skin hydrated, so they are ideal for those with dry skin. On the other hand, astringents work by fighting blemishes and are not advisable for daily use as they cause dryness. They are a much better fit for people with oily skin since they help tighten pores and decrease oil production. While there are a lot of toners “made” for dry skin, you still shouldn’t buy products just because they said they are compatible with your skin type. Make sure to check the labels and really understand the ingredients. Some companies aren’t true to what they claim so it’s better to be safe than sorry. These ingredients help hydrate and soothe skin before applying a moisturizer. Stay away from products containing alcohol, petrolatum, mineral oil, and sodium or ammonium lauryl sulfate. Witch hazel and menthol should also be avoided, and this applies to all skin types. On top of these, always choose to go fragrance-free as perfume makes skin more irritated. Called “clarifiers” or “fresheners,” they are simply eau de cologne for your face. The role of a toner is exactly what its name implies. Toners work by “toning” and evening your skin out. Toners can be used by everyone, but they should perfectly match your skin type in order to get its full benefits. So what works best for dry skin? We have chosen the Rose Water Spray by Bleu Beauté as the best toner for dry skin. Alcohol-free, it has rose water that restores the skin’s pH balance and brings back lost moisture. This toner also works as an anti-aging serum. It boosts collagen production, contains C and E and amino acids, and promises to offer immediate results.